From rev11743 the DPWS Explorer 2 is also compatible with services implemented according to the Committee Draft 01 of the OASIS DPWS Spec 1.1 2008/09 (e.g. interop scenario services). DPWS 2006/02 is supported by default at initial startup, via Menu “DPWS/DPWS Version” it is possible to switch to 2008/09 (and back) at runtime. Download the DPWS Explorer 2 here. 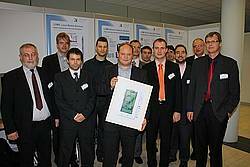 The Institute of Applied Microelectronics and Computer Engineering, University of Rostock, Germany – a partner of WS4D initiative – has won the ITEA Achievement Award in Gold as well as the ITEA Exhibition Award in Silver for the LOMS project at the ITEA 2 Symposium 2008 in Rotterdam. The LOMS project made use of WS4D technology in order to integrate localization systems and sensor networks. Dr. Frank Golatowski is organizing the 4th International IEEE Workshop on Service Oriented Architectures in Converging Networked Environments (SOCNE’09) which will take place in Bradford (UK) from May 26-29, 2009. This IEEE workshop encourages communication and exchanging of ideas between industrial and academic researchers and developers in the field of service-oriented architectures, their design and engineering process as well as their deployment for application prototypes. Important knowledge about future emerging directions for middleware, network infrastructures and self-organizing software/service architectures will be addressed. This time a special track on service oriented approaches in eHealth appliances was added. SOCNE is held in conjunction with the IEEE 22nd International Conference on Advanced Information Networking and Applications (AINA-08), Bradford, United Kingdom. The Devices Profile for Web Services (DPWS) – forming the basis of the WS4D tools – was submitted to the Organization for the Advancement of Structured Information Standards (OASIS). The Web Services Discovery and Web Services Devices Profile (WS-DD) Technical Committee will govern future developments and initiatives related to DPWS. The WS4D initiative is in close contact with WS-DD and will follow further progress of OASIS WS-DD in order to assure interoperability. The latest addition to our Sourceforge filereleases is a complete scenario consisting of three example applications written with JMEDS: a mobilephone application, a remote display and a remote keyboard. The devices are immediately runnable for testing purposes. The scenario should demonstrate some of the remarkable JMEDS features. (Note: At the moment, the display and keyboard device is only runnable on Windows based systems.) Get it here. Click on the thumbnail below to see a screenshot of the scenario. We have recently published a new revision of the Java Multi Edition DPWS Stack (JMEDS). It contains many improvements the community reported to us. We suggest all developers to try out this new release. Get it here (Filereleases) or here (SVN). Have fun. If you are unfamiliar with DPWS-based applications, then the packages ws4d-explorer* and ws4d-javame-examples of our SourceForge project pages are the right places to start with: Download a current version of the DPWS Explorer, start it and then download an example application. When you start the application, it should be displayed in the DPWS Explorer. You can now browse through the device and service information of the application and call some actions to understand the basics of the SOA-based DPWS technology. When you get interested, check out the ws4d-javame-documentation package for some example code snippets of simple DPWS applications. If you get the idea go to package ws4d-javame-full, download the stack for JAVA SE (ws4d-javame.stack.SE.jar) or JAVA CLDC (ws4d-javame.stack.CLDC.jar) and start developing your own DPWS-based applications. Click here to get to the packages and start downloading. Have fun! You can get them here. As usual, feedback is always appreciated. Have fun!